“When we escaped Azerbaijan in 1988, the state gave us temporary asylum here with assurances we would receive an apartment later,” said the 80-year-old widow. “But they forgot about us,” she continued, repeatedly pressing her face into her open hands. A “refugee,” Mrs. Sargsian is among the thousands of Armenians who fled their homes in neighboring Azerbaijan in the late 1980’s and early 1990’s. “Who needs a life like this? I don’t want to live in these inhumane conditions,” she added, gesturing at her run-down studio apartment. Sonya Sargsian resides in a dilapidated government-owned building housing impoverished pensioners and the homeless — one of three clustered in a forgotten suburb of Yerevan, the Armenian capital. Built as a student dormitory after World War II, the building has not been renovated since its construction. Residents share a common bathroom, which barely functions. Decrepit plumbing supplies water at irregular intervals. 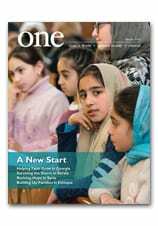 For more about the state of Armenia’s senior citizens, read the story, Pensioners in Crisis, by Gayane Abrahamyan, in the January 2008 issue of ONE.